In a large bowl, cream butter and confectioners' sugar until light and fluffy. Beat in egg and orange zest. In another bowl, whisk flour, baking soda and cream of tartar; gradually beat into creamed mixture. Stir in cherries and pistachios. Divide dough in half ; shape each into an 11-in.-long roll. Wrap in plastic; refrigerate at least 2 hours or until firm. Preheat oven to 375°. Unwrap and cut dough crosswise into 1/2-in. slices. Place 2 in. apart on ungreased baking sheets. Bake 8-10 minutes or until edges are light golden brown. Remove from pans to wire racks to cool completely. 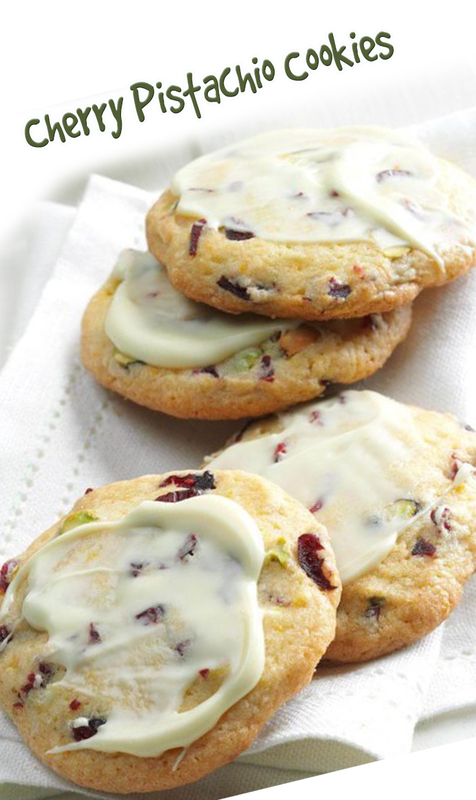 Frost cookies with melted white chocolate; let stand until set. Freeze option: Place wrapped rolls in a resealable plastic freezer bag and freeze. To use, unwrap frozen logs and cut into slices. If necessary, let dough stand 15 minutes at room temperature before cutting. Bake as directed, increasing time by 1-2 minutes. Decorate as directed.